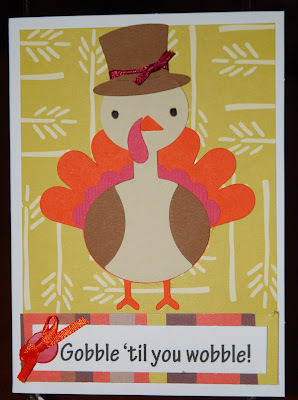 CardMonkey's Paper Jungle: Gobble 'til you Wobble! Isn't this card so stinkin' cute!? .... well, what can I say!? I have eaten far more than my share on Thanksgivings in the past, and have enjoyed every gobble that made me wobble! I'm pretty sure Emily used Cricut's Create a Critter for this card. If it's different, I'll repost. Thanks, Em, for your creative cutie-pieness. I love you!